Even for small weddings, there are decisions to make, details to confirm, and logistics to troubleshoot. 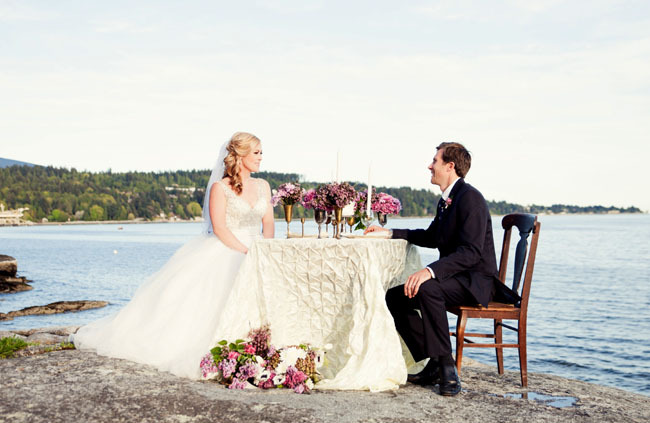 Our job as the elopement and small wedding experts of BC's Sunshine Coast (located just north of Vancouver) is to handle all the niggling details of your wedding day, making sure that everything runs smoothly. We do it all, so you can focus on what really matters: Each other. 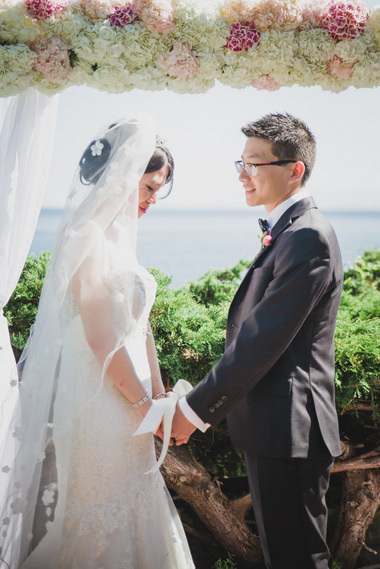 View your elopement and small wedding package options below, or contact one of our award-winning event planners at (604) 720-3698 or using the form on our contact page. Family & Friends Package ~ Our Best Seller! Coastal Weddings is excited to partner with Sunshine Coast Air for couples who want to add a little adventure to their elopement! 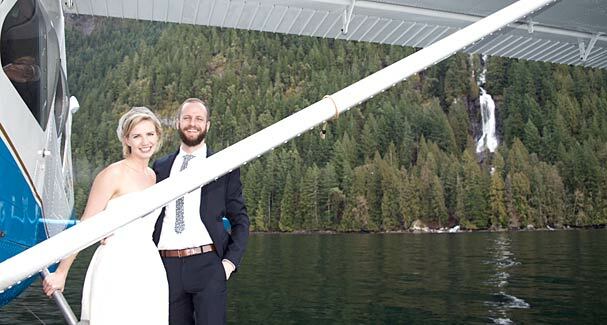 Fly in a float plane to the romantic Phantom Lake or get married with a private waterfall in the background. Your float plane can pick you up in Vancouver at YVR or Vancouver Harbour or from Sechelt. Contact us for more information and details. A good venue can make all the difference, but that’s especially true for your ceremony, reception and honeymoon. 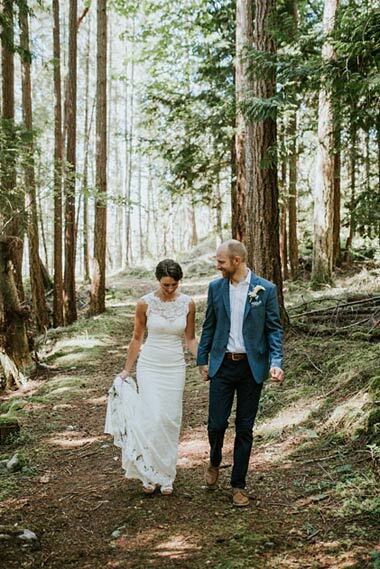 Whether you want to sleep in at a rustic and adorable cabin, or you picture an opulent wedding ceremony at a luxurious private estate home, Coastal Weddings & Events can put together an unforgettable, all-inclusive elopement or small wedding package for you on British Columbia’s Sunshine Coast. Melissa knows the coast inside and out, and has great relationships with all the vendors out there. She also has an amazing selection of rentals and was able to track down some crazy rental requests we had if she didn’t have them. 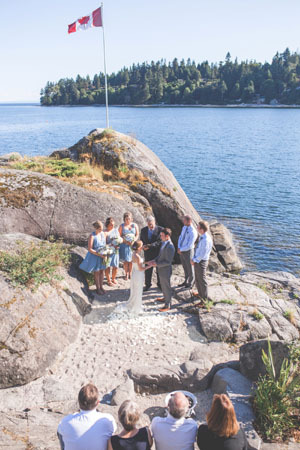 Below are just a few of the many options available to you for honeymoon, ceremony and reception venues along BC’s Sunshine Coast. Do you have something else in mind? Just let us know! 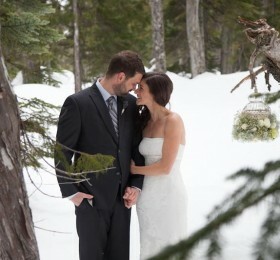 Contact us today at (604) 720-3698 or here to tell us about YOUR dream honeymoon, ceremony and reception venues. Celebrate your marriage surrounded by some of the region’s most impressive natural wonders. This beautiful log home has more to offer than you can imagine. The six-bedroom rental can accommodate up to 16 of your closest friends and family members, and includes extravagant amenities such as a gourmet kitchen, wood burning fireplace, free Wi-Fi and cable TV in every room. From the Sunshine Coast Waterfront Vacation Rental, you and your partner can spend your time lounging on the private decks, enjoying the majestic view of the ocean and surrounding mountains, or exploring the serene bay cove-by-cove. In the evenings, relax in the spacious great room before a cozy fireplace while you sip your tea or hot cocoa. Contact us at (604) 720-3698 or using our quick contact form for more information about the Sunshine Coast Waterfront Vacation Rental, where nature and luxury join together for an unforgettable escape. Imagine you and your honey at The Pointhouse at Sargeant Bay, a spectacular private estate right on the rugged coastline of the Pacific Ocean. Completely rebuilt in 2012, the Pointhouse property boasts 5-star amenities, exceptional service, and simply stunning views. You’ll find yourself surrounded by West Coast architecture and sleekly modern interior design, beautiful gardens, and panoramic views of the incomparable Sunshine Coast. Space is available for you and guests (if you so desire) at either the Pointhouse B&B, which can be rented for private functions, or at the gorgeous glass-walled Aerie guesthouse on the bluff. 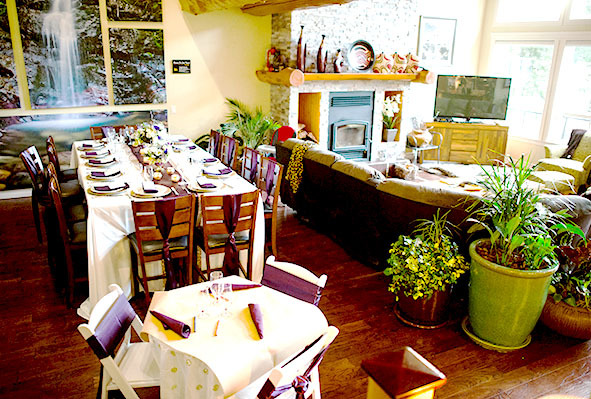 At 1,220 square feet, the Aerie guesthouse is ideal for more intimate gatherings. You can also choose to surround yourself by the 1,100-square foot Kwéx Pavilion, with its dramatic, winged rooflines, and cedar and fir post-and-beam construction. Take advantage of the outdoor kitchen with a barbecue and built-in bar area, a linear fire pit, state-of-the-art sound system with built-in speakers, and overhead infrared heaters that will keep your partygoers warm late into the evening. In a quiet corner across the garden pond is the Zen Teahouse Studio. This peaceful retreat has French doors that open onto a private patio where you can hear the soothing sound of a bamboo fountain. This small, intimate space is perfect for massage, yoga, or luxurious spa services for you and your party. Contact us at (604) 720-3698 or using our quick contact form for more information about the magical Pointhouse at Sargeant Bay. Simply the Best Beach House offers pure luxury with an ocean view. Simply the Best Beach House offers you and your special someone 2,500 square feet of spacious oceanfront luxury. Relax and enjoy spectacular ocean views and sunsets from every room in this sprawling home. When you awake in the morning, choose from three sea-view decks on which to soak up the unparalleled scenery while you and your honey enjoy a quiet breakfast together. Get cozy in front of the floor-to-ceiling native granite rock fireplace in the living room while gazing out the large windows at your ocean views. Then lie back and enjoy a peaceful night of sleep snuggled deep in the luxurious linens of the master bedroom’s king-sized bed. If this sounds like a honeymoon made for you, contact us at (604) 720-3698 or using our quick contact form. 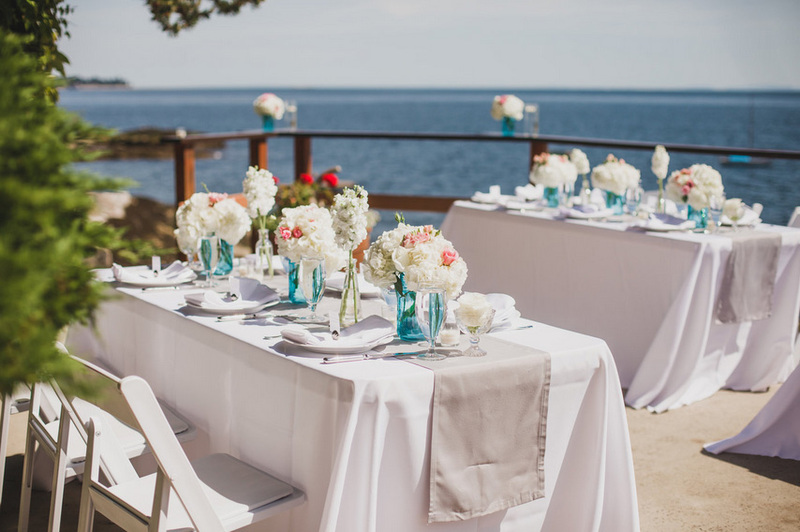 With dazzling sea views, a peaceful oceanfront deck for a ceremony or reception, and three quaint accommodations for up to a dozen of your closest friends and family members, the Catch of the Day Cottages are ideal for couples seeking an elopement or intimate beach setting for their wedding venue. Located in Sechelt on the lower Sunshine Coast of BC, the Catch of the Day Cottages boast dramatic vistas of the sea and towering evergreens. There are plenty of sweet little shops nearby to explore, as well as outdoor activities such as kayaking, diving, snowshoeing and skiing, offering you and your wedding guests a wide range of pursuits. 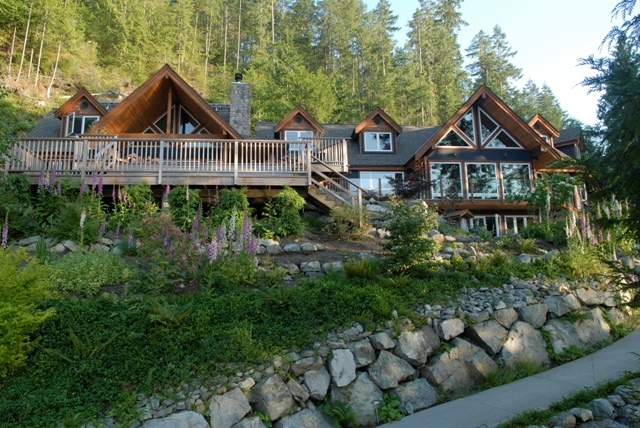 With comforts in the form of south-facing oceanfront views, gas fireplaces, well-equipped kitchenettes, private washrooms, WiFi, a BBQ deck, as well as a beach firepit, the Catch of the Day Cottages in Sechelt provide a perfect setting for your intimate elopement or small wedding on the Sunsine Coast. Contact us at (604) 720-3698 or using our quick contact form to reserve the Catch of the Day Cottages as your ceremony, reception and/or honeymoon venue. You made our small wedding simply PERFECT! Thanks you so much Melissa! If you’re looking for 5-star luxury on the lakefront, consider Sakinaw Lake Retreat & Guest Cottage. If you’re looking for 5-star luxury on the lakefront, Sakinaw Lake Retreat & Guest Cottage is a great option. 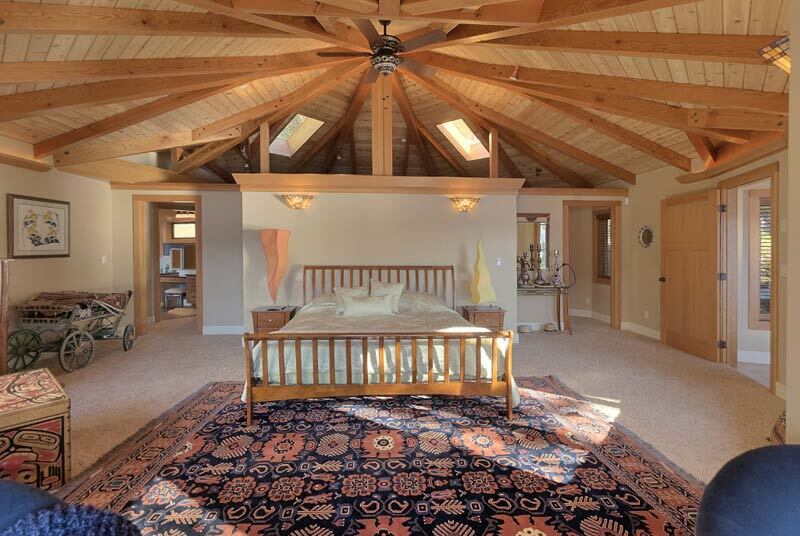 The Villa was custom-designed by a well-known BC architect, and boasts 3,000 square feet of gracious living space. With three bedrooms upstairs, and a magnificent master bedroom downstairs, the Villa sleeps 8 to 10 people comfortably. The great room, adjacent to the gourmet kitchen, is spacious and inviting, with a wood burning fireplace. Outside, you’ll find a barbecue and outdoor fireplace on a deck where you can relax while overlooking the picturesque Sakinaw Lake. The Guest Cottage offers 1,500 square feet with three bedrooms and two-and-a-half bathrooms. The Cottage has an open design, and leads out onto the large deck with an outdoor fireplace and barbecue. Other highlights of this lakeside property include a stately gated entrance, boat house, and launch, and fire pit. Contact us at (604) 720-3698 or using our quick contact form to discuss the luxurious Sakinaw Lake Retreat & Guest Cottage as a location for your wedding or honeymoon. A romantic oceanfront getaway destination surrounded by 10 acres of secluded natural forest. Sunset Cove Cottages is a destination surrounded by 10 acres of secluded natural forest. A perfect backdrop for magnificent photographs as you celebrate your love! Sunset Cove Cottages is a romantic, picturesque spot to exchange your wedding vows, with exceptional vantage points that showcase the remarkable view of waves, sky, and coastline. Both the Boathouse Cottage and the Falling Creek Cottage offer awe-inspiring views of our private, protected cove with its gentle waves and the magnificent sweeping vista of the Strait and Texada Island and the oceanfront is just steps away from either cottage. 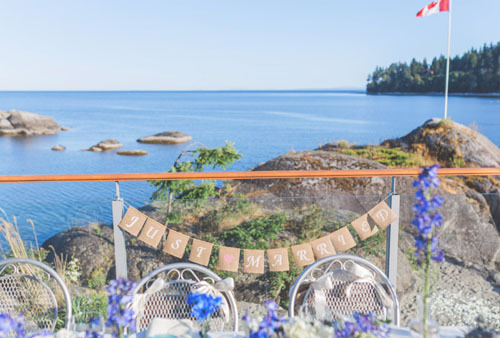 You decide where to pledge your love and commitment, be that under an arch set on the front lawn with an ocean backdrop, on the expansive deck of the Boathouse Cottage overlooking the sea to sky view, or standing on the rocky beach as the waves roll in. Up to five wedding guests can enjoy the two-bedroom Falling Creek Cottage, which is family friendly and has a generous living area and spacious eat-in kitchen. Both bedrooms feature a queen size bed but the master bedroom also has an en-suite bathroom with a custom live edge bathroom vanity. The adult-only Boathouse Cottage is a romantic one-bedroom oasis nestled into the rainforest with a gorgeous ocean view. Artfully decorated in West Coast chic, the Boathouse Cottage features a queen size bed, custom curated art and furnishings, and a focal point fireplace created using reclaimed wood as well as rocks gathered from the property. Generous skylights and the wrap-around deck maximize your view of the spectacular Sunshine Coast. 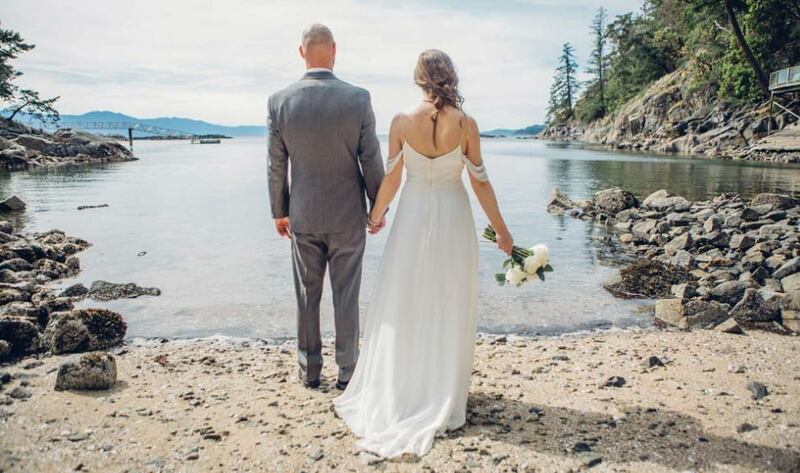 Contact us at (604) 720-3698 or using our quick contact form to discuss the Sunset Cove Cottages as a location for your wedding or honeymoon. Please call us to book now or request a quote at (604) 720-3698, or use our contact form by clicking here. Let’s Plan Your Dream Wedding! 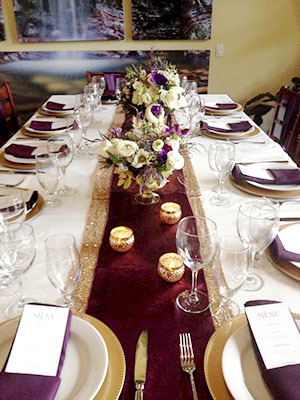 Understanding your vision and exceeding your expectations is the goal for Coastal Weddings & Events. Owner Melissa Tripp is known for her dedication to clients like you, and her exceptionally calm demeanor. You can sit back and enjoy your special day as Melissa and her award-winning team give the utmost attention to every detail of your ceremony, orchestrating a flawless event with an enthusiasm and warmth that’s infectious. 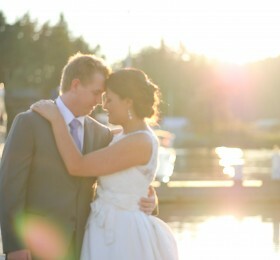 Your dream elopement or small wedding on the Sunshine Coast is just a step away. 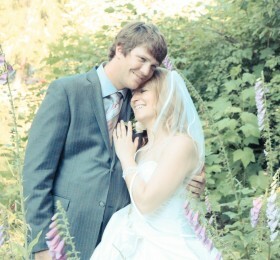 Call (604) 720-3698, or contact us here, and let's start planning today!